You are currently browsing the tag archive for the ‘Mickey’s Mechanical Man’ tag. 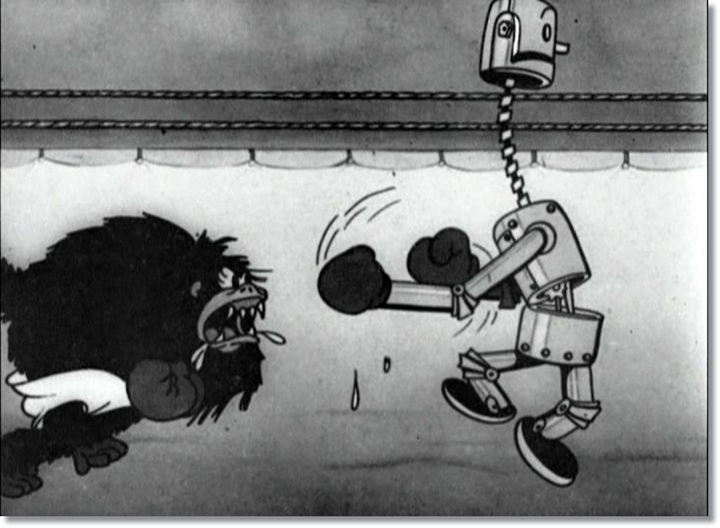 Mickey has build a robot to fight a gorilla in a boxing match, which is called “the battle of the century: machine vs. beast”. Mickey’s robot has one disadvantage: he runs wild when he hears Minnie’s car horn. Luckily, this fact helps him in the end: when he’s clobbered by the gorilla (on the tune of Franz Liszt’s second Hungarian rhapsody), he seems almost lost. But then Minnie fetches her car horn, revitalizing the robot. From that point he actually cheats, using multiple boxing gloves, a hammer and hits below the belt. Despite its clear story and high quality animation, ‘Mickey’s Mechanical Man’ is a very weak short, and a low point in the otherwise outstanding Mickey Mouse year of 1933. The cartoon is surprisingly low on gags and it’s difficult to sympathize with the robot character, as it’s mechanical after all, while the gorilla is a living being. Moreover, Mickey’s motives remain unclear and we’re not invited to care about the match. The cartoon most interesting feat. are the robot’s jerky movements, which are clearly mechanical and based on wind-up toys, but which become rather frantic and ridiculously elaborate when the robot goes wild. Nevertheless, there are some traces of Stan Laurel’s boxing moves from ‘Any Old Port’ (1932). ‘Mickey’s Mechanical Man’ is reminiscent of the Fleischer Studio’s equally weak ‘The Robot‘ (1932). Both films were inspired by rather hysterical stories about robots taking over jobs, which circulated in the early 1930s, and which struck a chord in an era of vast unemployment.